In 2012, before Femworking was a thing, a good friend had helped me with my blog, and in turn, I helped her to get a book reading for her new book. We’d gain so much clarity through examining each others’ businesses as opposed to our own. We had unknowingly stepped into our own little mastermind, and we loved it. We decided to formalize our experience, and the Femworking community was born. We added the Law of Reciprocity as one of Femworking’s core philosophies (The Law basically states that when someone helps you you’re naturally inclined to help them back). This coupled with naturally occurring accountability, made for an amazing mastermind experience. Our mastermind community is a unique hybrid community, but there are all kinds of ways to work a mastermind group. You could even have masterminds within a large community like ours. In this post I’ll talk about peer masterminds. That is, a mastermind where you are equal with the other attendees, and you are creating the mastermind as a formal way to share and grow rather than your own business’ profit stream (although much of what I give you here could be used in a for-profit mastermind scenario). Get your FREE Mastermind Starter Kit! editable Canva swipe files, mastermind starter kit workbook, format and rules templates, editable conversation starter templates, and more! Congratulations! Your Mastermind Start Kit is now available for download! Ask anyone who’s ever participated in a mastermind, and they’ll probably tell you it’s been an invaluable part of their business growth. While the ideas, resources, support, vision, perspective, and accountability that come out of these micro-communities are often times intangible and hard to measure, the business growth that they lead to can be exponential. The group can also act as a sandbox for you, allowing you to test ideas and get feedback from your trusty sounding board before spending time and money on a venture that might not make sense. A mastermind can help you focus your business, create a successful launch plan, and increase profitability. The most valuable parts of a mastermind are the outside perspectives and clarity, and when others can lovingly show you things you are not able to see, whether that’s what an amazing rock star you are, or the sneaky self-sabotaging behaviors you’ve been engaging in. The best masterminders will ask you questions and help you find your own truths. They will help your compass find it’s true north. And the biggest intangible benefit we hear from our own Femworking members time and time again: accountability. Declaring the actions you will take to a group and knowing you will meet with them again is HUGE. Your mastermind buddies are going to want to know how you fared in the work you said you would do. They’ll hold you accountable. Entrepreneurship can be lonely – and only other entrepreneurs can really “get” what the experience is like. Having your own board of trustees, a mastermind community, is the perfect remedy to that. And, if you organize it yourself, it can be FREE! My personal favorite style is an hour-long, once a month, virtual meeting. There are also mastermind retreat experiences where entrepreneurs meet one day a year for a whole year. You get to decide the frequency, duration, and whether you want virtual or in-person, but I suggest investing some time up front to really think through and establish a smart structure. A little bit of setup will help your mastermind go a long way. 0:00 – 0:08 – Each meeting starts with each member sharing the peak and pit of their past month. Allow 1-2 minutes per person. In a secondary mastermind pilot we did here at Femworking, we liked to share what I called the “peak and the pit” (adopted from the Kardashians) – the high and low point of their business or personal life since the last time the mastermind met. This is also a great way to bring in some personal elements to the mastermind. You can give your mastermind a theme or a word-of-the-year, and can refresh it each month or year. Have fun with it. 2) Figure out tech, if you need it. If you’re meeting virtually you need to decide whether you’ll use a conference line, Skype, Zoom, GoToMeeting, or another platform. We used a conference line each month and had the members rotate who was responsible for hosting the call (both being the conference line host who dialed in first and facilitating the call itself). And if you’re going to have a virtual mastermind I suggest creating a secret Facebook group. Yes – I know, another Facebook group. But it’s important for you to have a place that you can interact between calls, and you’re going to want to celebrate your little wins, vent your frustrations, and reach out for help between calls. The Facebook group is a great place to nurture your mastermind and build relationships between actual meetings or calls. Don’t forget to nurture your group. If you’re forming the mastermind yourself, you’re in the privileged position of hand-picking each attendee. Sid Sivara over at LifeHack suggests including mutual beneficiaries – people who will bring different value that will complement the rest of the members. You can even focus this into skill sets by inviting one person who’s great at marketing, another who’s a fantastic copywriter, another who is an SEO master, someone who’s great at doing video. Each person’s skills can complement the others and you can grow and learn from each other. And while I believe in being strategic, make sure your participants know that a mastermind group is not a networking group. Masterminds are about growing your business, they’re not for getting referrals (although this will probably happen organically from time to time). where you keep everything for the mastermind (rules, ideas, resources, accomplishments). 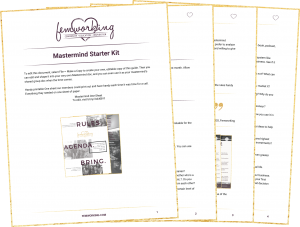 Be sure to get our free mastermind starter kit, which not only functions as a workbook to guide you as you flesh out your Mastermind details, but can also serve as your mastermind’s community google doc moving forward. Write a few of your own rules for your mastermind, and keep them in a joint google doc or on a canva graphic for your members to use as a reference. We created a handy one-sheet for our mastermind members that contained the facilitator rotational schedule, the rules for the group, and call-in information. Check out our free Mastermind Starter Kit to get access to the exact canva doc we used – it’s even editable! When choosing members you should also think about what’s important to you in the overall experience. Do you value confidentiality? Vulnerability? Heart-led collaboration? Do you prefer to analyze business in a more logical and analytical way? You want your mastermind to be a safe place, where members can be real with each other. One thing we consistently hear from our members is how safe they feel sharing with the entire rest of our group. They know that we strive to honor where each person is at in their business, to not judge, and to love each other unconditionally. The bottom line is that you can get more done when you can be more open and honest. When you can be real and fully present instead of worrying about what other members will think of you or if they’ll talk about your struggles behind your back. Cultivate trust and love, and vulnerability will follow. Then comes the real growth. Get our conversation starters in your free Mastermind Starter Kit. Remember that Google Doc I mentioned earlier? You can use that doc as a place to keep track of your wins, your results, and even resources that get mentioned. Tracking your results will help you see the value of the mastermind, and including resources will turn your google doc into a treasure trove of gold you can keep for a rainy day. Now, we want to hear from you! Will you start your own mastermind? Are these resources useful to you? Leave a comment here or hit us up over on Twitter. We hope you have a great time masterminding!